After a freezing cold winter, NYC is finally heating up. This summer, it’s just a quick ferry ride away from the steamy concrete jungle into the big city’s own island dance music oasis - ‘Open Air NY.’ TC Events & Promotions LLC, the team behind programming/producing Time Warp New York this past November, will be partnering with The Lure Group, a full service hospitality company behind the brands Slate and Clinton Hall, to exclusively produce the ‘Open Air NY’ outdoor electronic music event series at The Lure Group’s Governors Club on Governors Island NYC. 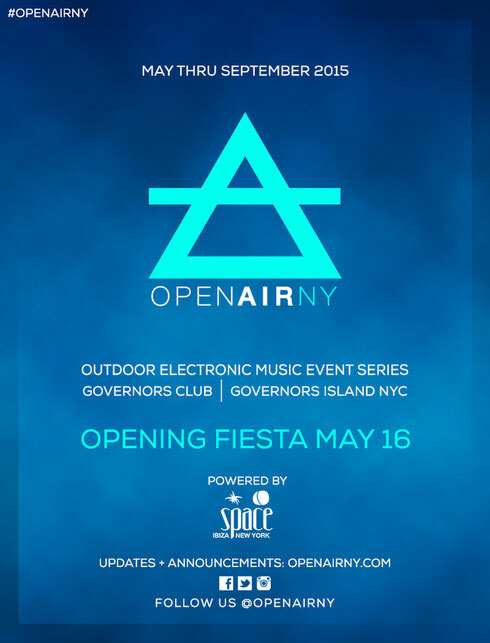 The inaugural season will start in May and run through the end of September with all marketing for ‘Open Air NY’ powered by Space Ibiza New York and operated by the Lure Group. “We’re excited to partner with TC Events & Promotions to create an unprecedented music program this summer at Governor’s Club. ‘Open Air NY’ will attract dance music enthusiasts from all over the world and unite under one roof to enjoy a lineup of unparalleled talent.” - Telly Hatzigeorgiou, founder of The Lure Group and Governor’s Club.